One of our October veggie deliveries. You may have noticed that I don't have anything up about vegetable gardening. I would love to have a big vegetable garden, and I did for a few years. However, there were several competing factors, and the vegetable garden just lost out. First of all, I'm pretty much the only person at our house that likes to eat some vegetables. I grew all sorts of stuff, but I'm the only one who will eat a tomato, an eggplant, or black-eyed peas. Second, growing vegetables takes a lot more work than growing fruit. With a little kids and a full time job, I just don't have the time to do it all by myself. I can grow fruit trees or veggies, but I can't do both and still keep up with everything else. Luckily, we're members of a fantastic community supported agriculture (CSA) program through Evan's Veggie Farm in Hempstead, Texas. 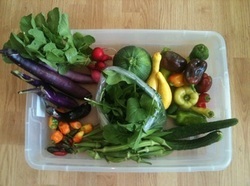 They deliver a cooler full of fresh vegetables and pastured eggs to our door every Monday. My wife and HOA won't let me have chickens, so this is the best way to get good eggs. It also means that I get all the enjoyment of delicious homegrown veggies, but without the time spent weeding, watering, and worrying. Plus we feel good knowing that we're supporting a local family business. Wash/de-seed fruit and chop it up in a food processor or a blender until you have 6 cups. Add 6 cups of water, and boil on medium high heat for 20-30 minutes until the peel is soft. This takes longer for thick peeled fruit like grapefruit, and very little time for thin-peeled fruit like kumquats and Meyer lemons. After the peel is soft, add in 6 cups of sugar and bring to a boil for another 20 minutes or so. Stir frequently. When the mix starts to thicken, see if it is ready by putting a little on a frozen plate. If it runs it's not ready yet, but if it gels on the plate you're good to go. 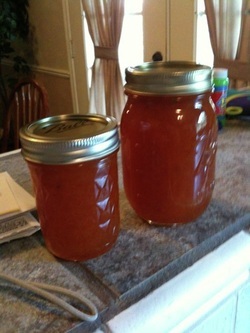 Ladle the marmalade into clean jars, and seal. Process the jars in a boiling water bath for 10 minutes to make double-sure it won't go bad, and then place on the counter to cool. This recipe make 4 pints. Citrus leaves damaged by miners. The Asian citrus leaf miner is a pain in then neck. If you ever get curled up leaves with shiny squiggles, you've got them too. 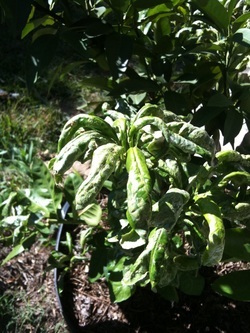 The miner is the larva of a little white moth, that burrows into the leaf of citrus trees causing the damage shown in the picture to the left. Once the larva is inside the leaf, there's really not much you can do about it. I've tried spraying with spinosad (organic spray), but I haven't noticed any real difference. It seems that the miners go after new leaves, and whatever happens to be vulnerable when the miners are active is going to get some damage, regardless of whether or not it has been sprayed. At least that's been my experience. According to Dr. Bob Randall, they won't kill the tree, although fruit production would probably be better if they were prevented. They just drive me crazy. I don't like spraying if I can help it, because I don't want to do anything that might harm the bees. Without the bees to pollinate, there won't be any citrus at all. I've thought about spraying all of my trees except for one to use as a sacrificial bait tree, but I haven't yet. During the winter of 2009/2010, I measured low temperatures of 17 degrees. Sustained temperatures this low will kill all but the most cold hardy citrus and fruit trees to the ground. Fortunately most of my trees were still very young and small, and so they were much easier to protect than large trees. To try to keep everything alive, I strung Christmas lights with the big C7 bulbs around the trees, and then covered them with 2 sheets of plastic. Keeping the plastic over the trees was a real challenge during some of the windier nights. 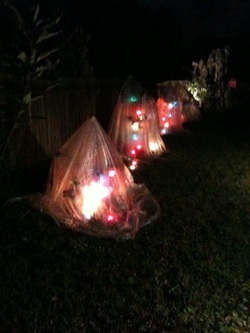 My neighbors thought that I was very strange putting up lights in the backyard but not in the front. This turned out to not be a very good method. Those lights put out a lot of heat, but using plastic really wasn't the best idea. The plastic doesn't breathe at all, and I wound up lightly steaming my trees. I used plastic because it was cheap, but it would have been better to use sheets (which I didn't have), or just lights with no cover. I think it would have been fine, except that I had to leave for work at 5 am when temperatures were still dangerously low, and I couldn't unwrap the plastic. All I could do was ask my wife (who was 9 months pregnant and in no mood for tree nonsense) to unplug the lights for me after the sun came out and it warmed up a little bit. Sometimes she got to it, sometimes she didn't. When she didn't, I bet it got up to 100+ degrees in those little plastic tents. Fortunately there was no significant damage. I made it through the freezes with only two casualties, in spite of the plastic. I had a young Chandler pummelo that didn't make it, and my Ruby grapefruit got foot root rot from the rain forest like conditions under the plastic. I dug it up and put a fungicide on the affected areas, and it actually survived. It's currently transplanted to another area of the yard, where it seems to be hanging in there for now. My Mexicola Grande avocado suffered some die-back, and my Fuerte avocado was completely killed. The next time we get some bad freezes in the forecast, I'm going to go to Goodwill and get as many sheets as I can. I'll still string lights up in the trees, but I won't use plastic again. I'll also put out gallon jugs of water and mound mulch up around the graft unions.